Megan Draper (Jessica Paré) in a Mad Men season 7 promotional photo. Image: AMC. 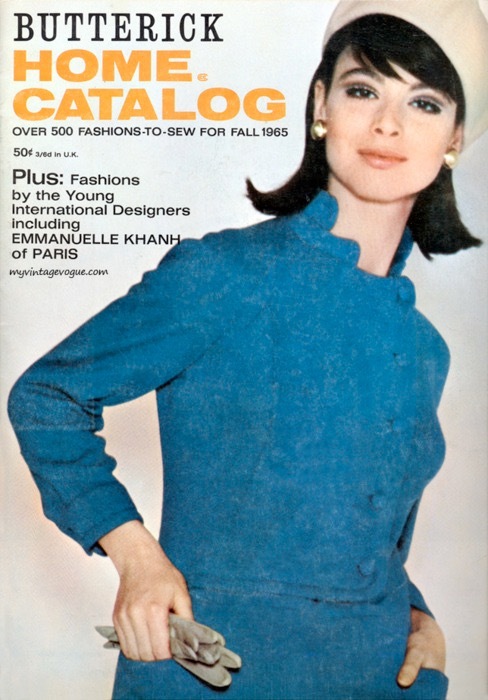 My series on Mad Men-era designer patterns concludes this week with three Butterick Young Designers: Mary Quant, Jean Muir, and Emmanuelle Khanh. 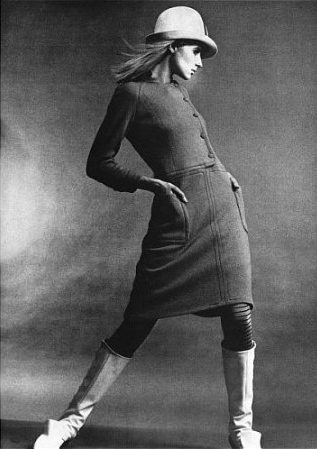 Mary Quant (b. 1934) was the first designer to be signed to the new pattern line. Born in London, Quant met Archie McNair and her future husband, Alexander Plunket Greene, at art school; together they opened a boutique on the King’s Road, Bazaar, in 1955, selling Quant’s fun, youthful designs. Quant is perhaps most famous as a pioneer of the miniskirt. Butterick released its first Quant patterns, featuring Celia Hammond photographed by Terence Donovan, in the fall of 1964. 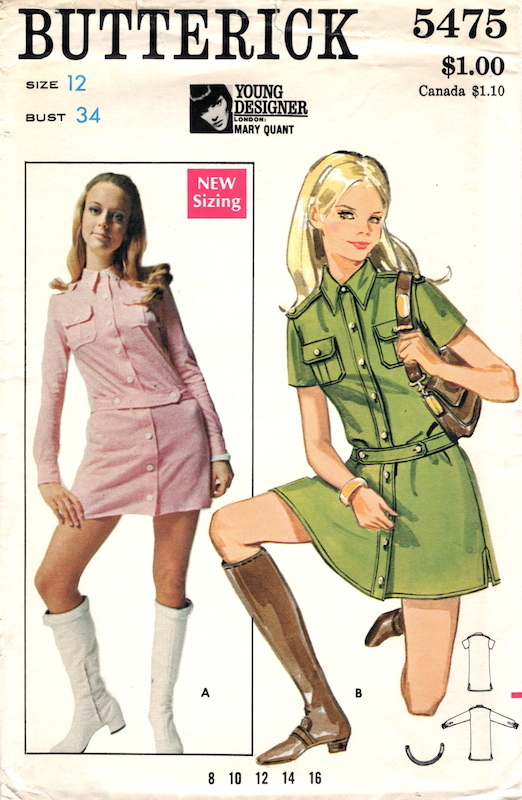 Butterick 5475 by Mary Quant (1969) Mini dress. Also born in London, Jean Muir (1928-1995) showed an early talent for dressmaking and needlework. During the 1950s, after working her way up from the stockroom at Liberty, she was hired as designer for Jaeger; she stayed with Jaeger until 1962, when she founded her first label, Jane & Jane. She launched her eponymous label in 1966. Muir was known for her fluid dresses with charming dressmaker details. 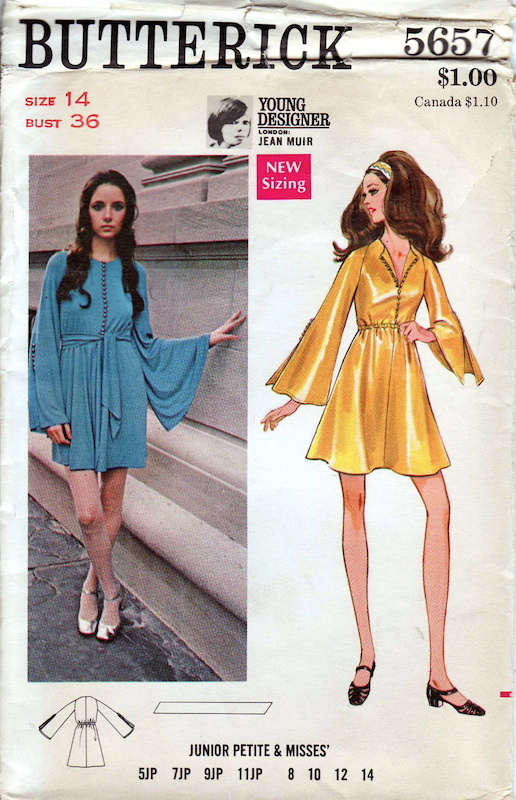 Butterick 5657 by Jean Muir (c. 1969) Image: eBay. Born in Paris as Renée Mésière, Emmanuelle Khanh (b. 1937) married avant-garde industrial designer Quasar Khanh in the late 1950s, around the same time that she began working as a house model for Balenciaga and Givenchy. Turning her hand to fashion design, Khanh was soon at the forefront of yé-yé fashion (Paris’ answer to Youthquake), designing for brands including Cacharel and Missoni before launching her own label in 1969. (Read a 1964 LIFE magazine article about Khanh here.) Today her company focuses on accessories, particularly eyewear. Emmanuelle Khanh dress on the cover of the Butterick Home Catalog, Fall 1965. Image: myvintagevogue. Jill Kennington in Butterick 3718 by Emmanuelle Khanh, Queen magazine, 1965. Image: Amazon. It’s interesting to see an established company like Butterick responding to contemporary Sixties youth culture, facilitating access to Youthquake and yé-yé fashion in the process. I made a number of these patterns by Betsey Johnson and Kenzo in the early 70s. It was the only way for a teenager to wear anything remotely like we were seeing in “Seventeen” magazine. The ones by Willi Smith and John Kloss were great as well.